Happy Friday dear readers! I had a post planned this week about the whole GamerGate debacle sweeping through Twitter like wildfire, but then my wife went into labor on Monday night and long story short, I'm a dad now and all my energy has been spent taking care of my wife and infant daughter Hannah. I like to give away lots of free legal information on this blog because I think it’s important for artists to have a basic understanding about how the law interacts with them. I was once in your shoes. I’ve had my ideas stolen, my copyrights compromised, and been in situations where a little legal knowledge could have saved me from a jam or two. At the same time, you can’t cut lawyers entirely out of the equation simply because you possess that knowledge. Legal information without analysis is just raw data. It can’t give you advice or insight. It can’t examine your specific situation and provide you with synthesized options based on that data (i.e. 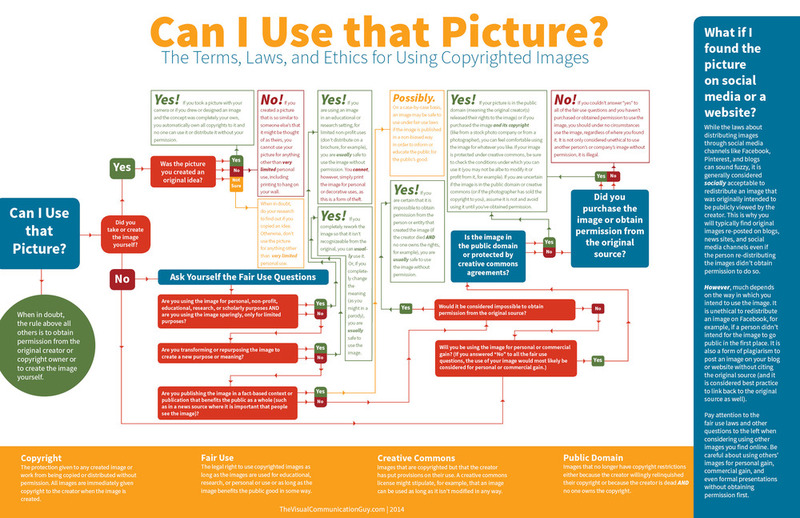 just because you know the fair use factors doesn’t mean you know how to apply them). No two situations are the same and everyone’s needs will differ depending on a variety of unforeseeable factors. Only a properly trained lawyer familiar with your circumstances will be able to navigate that minefield. This is a reasonable view and I stand by it. Law without anlysis is just data, and data without analysis is useless. That said, I'm sharing this chart anyway because some of you may not have the finances to hire a lawyer, and having some information is better than having none. In fact, I've whittled it down to a pretty simple formula. So hang onto this chart and use it when you need to, but just remember that this is only part of the story and it may not apply to your situation. Be careful out there and call me or another qualified attorney if you have any questions about what this all means. I'll be back soon with my thoughts on GamerGate and some other recent news items. Until then, Cheers! As far as the law is concerned, copying is copying, no matter how noble your intentions. I'm an artist too, so I get it. We are constantly bombarded by stimuli, so it's hard not to be inspired by those images. And it's even harder to avoid relying on those images when we make our own work. My advice is to try even harder than that. Because, unfortunately, copyright holders (often, but not always, large corporations) are less inclined to care about why you copied them and more inclined to sue you into oblivion if that's what they feel is required to protect their work. Case in point: last month, a Boston-based company called Autonomie was sued for trademark infringement by Converse for making a sneaker so similar to Converse's iconic Chuck Taylors that it's nearly impossible to tell the two apart (the shoe is actually manufactured by a British company called Ethletic). Here are the shoes side-by-side. But this isn't just ripping off for the sake of ripping off. Autonomie is all about using eco-friendly materials and fair trade practices so as to produce "high-quality garments at competitive prices to consumers that wish to make purchases with a social and environmental impact without having to sacrifice their own personal style, or break their wallet." That's a pretty good reason, right? Too bad. The law says this is trademark infringement because there's a high likelihood that the two shoes would be confused with each other, thus steering profits away from Converse. In trademark law, this is called "blurring." Autonomie's reasons may be noble, but noble doesn't go very far in court. Remember the whole Robin Thicke/ Marvin Gaye copyright infringement situation that came up a few months ago? Thicke was so inspired by Gaye's work that he wanted to make a song that sounded like something Gaye himself might have written. The end result was that Thicke's fanboyism got him in a legal tussle with Gaye's family. The reasons for copying rarely matter from a legal perspective. There are very few mechanisms in the law that allow it, and they only apply in certain situations. Fair use, is the most commonly used exception but the only way to find out if it protects you is to get sued, go through months of litigation and thousands of dollars in legal fees, and find out in court. As far as I'm concerned, getting sued and winning is the same as losing because the amount of time and money required to defend yourself would never be recouped. Copyright holders don't care what your reasons are. They only care if your work will take money out of their pocket. So don't pay homage. Don't pay tribute. Don't use the copyrighted works of others unless they give you written permission. If they don't give you permission, be creative and find another way to express yourself. Be original always in all ways, because copying someone else, even if your intention is to honor them, is the quickest way to get legally smashed. And instead of making art, you'll be paying off copyright fines.